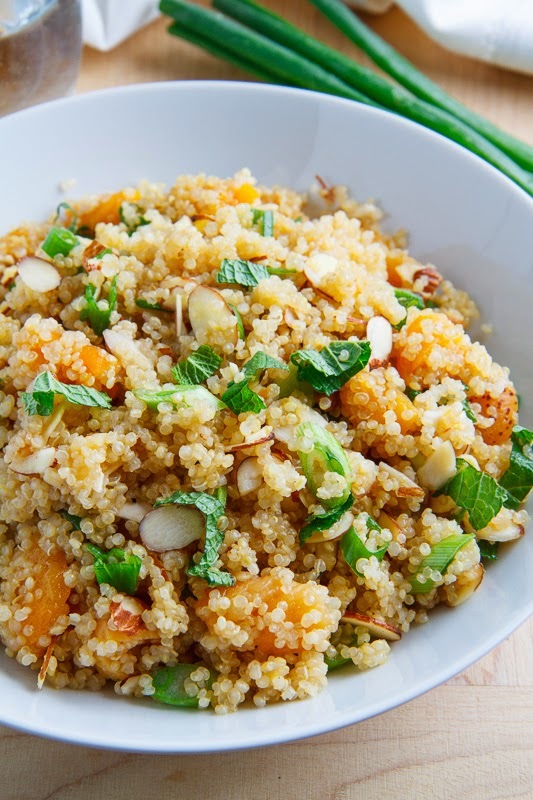 A light and tasty apricot quinoa salad packed with fresh herbs. 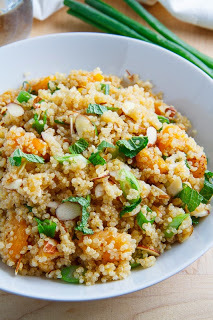 With Easter coming I have been thinking about menu ideas and one of them involved an apricot theme so I was looking for an appropriate side dish and I was thinking that a Mediterranean style couscous salad would be perfect. I have really been into quinoa lately so I replaced the couscous with quinoa and I added some chopped dried apricots to the quinoa while it cooked so that they would get nice and soft and tender. After that I added a complement of fresh herbs including mint, parsley and green onions along with some slivered almonds. The salad is finished off with a simple ‘dressing’ based around apricot preserves, lemon juice and ginger. This apricot quinoa salad is amazingly light, fresh and tasty and the mint really brings it home; it’s a fabulous side for any meal! Bring the water, quinoa and dried apricots to a boil, reduce the heat and simmer, covered, until the quinoa is tender and has absorbed the water, about 15 minutes, remove from heat and let sit for 5 minutes, covered. Mix the quinoa, almonds, green onions and mint and toss with the mixture of the apricot preserves, oil, lemon juice, ginger, salt and pepper. I'm a big fan of quinoa salads and this one looks super unique and flavorful! I love apricots! This looks delicious! I love the idea of an apricot themed Easter menu! It's such a great spring flavor. this salad looks like the perfect side! Loving all the apricot recipes! This is a great idea to add some sweetness to quinoa. I just found your blog and made this with the Apricot Glazed Salmon. Both were delicious!!! Can't wait to try more recipes!! !